[Oncotarget has] the feedback from the review committee, and they can choose to share that or not…but we don’t share the scientific review by the experts. Journals may be deselected from MEDLINE for various reasons including, but not limited to, extremely late publication patterns, major changes in the scientific quality or editorial process, and changes in ownership or publishers. Backus added that since she’s worked with MEDLINE over the past few years, only “a handful” of journals have been removed from the index. It’s not very many. It’s infrequent. Oncotarget has been on our radar for some time. Besides a handful of retractions that we’ve covered, we’ve obtained emails that show an editor of the journal, Mikhail Blagosklonny, contacted colleagues of Jeffrey Beall at the University of Colorado Denver who had published in Oncotarget in 2015 after Beall added the journal to his (now inactive) list of possibly predatory publications. In a series of emails, Blagosklonny told the researchers that Beall had tipped him off that their work might be fabricated, and Oncotarget was going to have to retract their papers. Eventually, Blagosklonny withdrew his retraction threats. As of August 2017 Oncotarget is not currently indexed in MEDLINE. However, all content from the launch of the first Oncotarget issue in May 2010 through Volume 8 Issue 30 remains. Moreover, Oncotarget content continues to be indexed in PubMed and PubMed Central as well as ISI/Web of Science: Science Citation Index Expanded, Scopus, Biological Abstracts, BIOSIS Previews, and EMBASE. In addition, in cooperation with the National Library of Medicine, Oncotarget is working towards its goal to submit an entire issue with full text papers (not just abstracts) to PubMed just days after online publication. We are right now in the process of understanding and addressing MEDLINE comments. Please note that overall MEDLINE comments about Oncotarget are very positive. As we all, including Retraction Watch, are working on making the publishing industry better and ready for the challenges of the 21st century, Oncotarget continues to make all efforts to meet the highest standards of the industry. Note: If you’re confused about the difference between MEDLINE, PubMed, and PubMed Central, you’re not alone. Check out this handy guide from the National Library of Medicine, which explains that PubMed includes references from other databases besides MEDLINE, and PubMed Central is a repository for free full-text papers, such as from open-access journals like Oncotarget. Oncotarget is no longer indexed in MEDLINE, and the last volume to be included is volume 8 issue 30, 2017. The information is misleading as the journal is and will be indexed on PubMed. In general, Abstracting/Indexing category states indexes that cover the journal, not hundreds of indexes that do not. The previous statement was not cited. Qcist.com, which also wrote about the MEDLINE deselection, corrected its original post to explicitly note that new issues of the journal will still be accessible on PubMed. Unfortunately, that article expresses confusion about these three entities and adds to it by not making the distinctions that are straightforward. MEDLINE is a subset of PubMed, distinguished by MEDLINE records being indexed with MeSH, and is searchable through many interfaces other than PubMed. Basic citation data is not “indexing.” Indexing is the act of adding controlled vocabulary to citations to describe the concepts expressed in the article. MEDLINE does indeed act as quality gatekeeper by maintaining standards for journals that are indexed. MEDLINE records are easily separated from non-MEDLINE PubMed records by using the MEDLINE subset [sb] or searching with MeSH. PubMed Central is an entirely different entity. Poor “branding” perhaps, but that’s a separate issue. The study “South African-authored articles in predatory journals” include Oncotarget as a probably predatory with strong evidence (Table 3: Classification of ‘predatory’ papers by journal (2005–2014)). 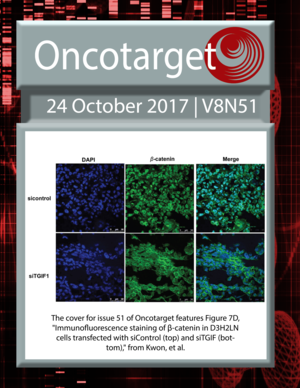 Oncotarget is not listed in DOAJ (Directory of Open Access Journals). Oncotarget does not “continue to be indexed in PubMed and PubMed Central…” An indexed PubMed citation is by definition a MEDLINE record. PubMed Central is a repository and does not provide indexing. Non-indexed citations from Oncotarget will “still be accessible on PubMed” but that’s not the same as “new issues.” New issues will be available in PMC, the repository. These distinctions are important! Would they be subject to a Freedom of Information Act request? Too bad, there are some good papers there. I feel like Beall’s list has done more harm than good. In the same vein, all studies wherever published should be scrutinized. Too often, publication in a certain journal is taken as an absolute sign of quality. Its the predatory journals that are doing the harm, don’t shoot the messenger. In these days of fake news public belief in science is ebbing, clouding the waters with non-peer reviewed articles (as has been the case in oncotarget) will further this alarming trend. In fact supplying support to in the uninformed that science cannot be trusted. Its unfortunate that some decent work has been published there, but for the good of both the scientific and layman communities these journals need to be highlighted as suspect as early as possible. Aging (Albany NY). 2010 Dec;2(12):924-35. DNA damaging agents and p53 do not cause senescence in quiescent cells, while consecutive re-activation of mTOR is associated with conversion to senescence. Department of Cell Stress Biology, Roswell Park Cancer Institute, BLSC, L3-312, Elm and Carlton Streets, Buffalo, NY 14263, USA. Cancer Res. 2004 May 15;64(10):3653-60. Brander Cancer Research Institute and Department of Medicine, New York Medical College, Valhalla, New York, USA. J Clin Invest. 2000 Feb;105(4):533-9. Pretreatment with DNA-damaging agents permits selective killing of checkpoint-deficient cells by microtubule-active drugs. Blagosklonny MV1, Robey R, Bates S, Fojo T.
Medicine Branch, National Cancer Institute, National Institutes of Health, Bethesda, Maryland 20892, USA. Low concentrations of paclitaxel induce cell type-dependent p53, p21 and G1/G2 arrest instead of mitotic arrest: molecular determinants of paclitaxel-induced cytotoxicity. Giannakakou P1, Robey R, Fojo T, Blagosklonny MV. Medicine Branch, National Cancer Institute, NIH, Bethesda, Maryland, MD 20892, USA. Br J Cancer. 2000 Sep;83(6):817-25. P21-dependent g(1)arrest with downregulation of cyclin D1 and upregulation of cyclin E by the histone deacetylase inhibitor FR901228. Sandor V1, Senderowicz A, Mertins S, Sackett D, Sausville E, Blagosklonny MV, Bates SE. Medicine Branch, DSC, NCI, NIH, Bethesda, MD 20892, USA. Accumulation of hypoxia-inducible factor-1alpha is limited by transcription-dependent depletion. Demidenko ZN1, Rapisarda A, Garayoa M, Giannakakou P, Melillo G, Blagosklonny MV. Brander Cancer Research Institute, New York Medical College, Valhalla, NY, USA. Inhibition of HIF-1- and wild-type p53-stimulated transcription by codon Arg175 p53 mutants with selective loss of functions. Blagosklonny MV1, Giannakakou P, Romanova LY, Ryan KM, Vousden KH, Fojo T.
Medicine Branch, National Cancer Institute, NIH, Bethesda, MD 20892, USA. Aging (Albany NY). 2013 Jun;5(6):474-84. Kolosova NG1, Vitovtov AO, Muraleva NA, Akulov AE, Stefanova NA, Blagosklonny MV. Institute of Cytology and Genetics SB RAS, Acad. , 630090, Novosibirsk, Russia. Proc Natl Acad Sci U S A. 2012 Aug 14;109(33):13314-8. doi: 10.1073/pnas.1205690109. Epub 2012 Jul 30. Leontieva OV1, Natarajan V, Demidenko ZN, Burdelya LG, Gudkov AV, Blagosklonny MV. Department of Cell Stress Biology, Roswell Park Cancer Institute, Buffalo, NY 14263, USA. I think it matters less that it’s not indexed in MEDLINE and more that when someone’s grant application or tenure case shows up and has Oncotarget publications those might be dismissed because of the known issues. Yes, this is going to be a real issue now. Oncogene. 2007 Oct 18;26(48):6954-8. Epub 2007 May 7.
p21(Waf1/Cip1/Sdi1) mediates retinoblastoma protein degradation. Broude EV1, Swift ME, Vivo C, Chang BD, Davis BM, Kalurupalle S, Blagosklonny MV, Roninson IB. Cancer Center, Ordway Research Institute, Albany, NY 12208, USA. Does any serious bioscience researcher, academic or otherwise, actually use MedLine to search for literature? I think I used it a couple times back in the days of TelNet, but now everyone just uses PubMed without caring about where the content comes from. We trust NLM/NCBI to curate, and forget about the details of how it works. By continuing to be listed on PubMed, this decision will have virtually no impact on OncoTarget visibility. It’s like a Mom & Pop store ceasing to carry a product, but the product is still freely available on Amazon. So, how long before pubmed blacklists journals who continue to publish science fraud? Afterall, publications are the basis of grants. Amanda, your MEDLINE “rather than PubMed” adds to the confusion of the interface for the content. There is no PubMed search that is not a MEDLINE (+) search unless you use NOT medline[sb] with your search string. The fact that citations from journals that will never be indexed, i.e., never become a MEDLINE record, are in PubMed is really not a problem if one is clear on this distinction. Searching MEDLINE via a non- PubMed interface is probably a bad idea for an SR unless one includes a “pre-MEDLINE” (aka, PubMed records) search. BTW, if you are unable to define “predatory journal,” how can you warn systematic reviewers about them without introducing bias into the SR process? One can more convincingly argue that journal titles and authors should be blinded to reviewers to avoid this kind of publication bias – the quality of the research is what determines if it’s included in final SR analysis, not the relative prestige of the author or journal in which it is published. You are right. Nobody uses meddling anymore. Last time I used it was 17 years ago during my PhD days. As long papers from Oncotarget keep appearing on Pubmed who cares about Medline. Medline is still used and is the preferred interface is OVID. Yes, there are Advanced Search fields in PubMed (which is Medline and other sources) but it doesn’t allow for proximity searching (v important for SR search strategies). PubMed should be searched in addition to Medline (as well as other databases) to retrieve non-Medline citations. This is the ideal scenario but not everyone does this. Previous Previous post: Caught Our Notice: Is “miscommunication of the rejection” the new euphemism for “paper accepted”?